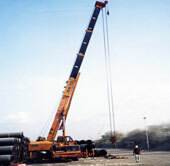 SULTANěŻ˘> is a market leader within the logistical industry of Oman & the GCC. The Company provides a comprehensive product range covering multiple vehicle & equipment categories to a wide spectrum of end-users including, our principal users, the Oil & Gas Industry, Government and construction, as well as for public and commercial applications. Technical inspection company (OVERSEAS TECHNICAL INSPECTION SERVICES - OTIS). Each Company compliments each other, and further growth is forecasted, to further service the requirements of today's changing environment. Sultan's was founded in 1990. Today, it has business presence in most locations within Oman and territories around the GCC. With these points of presence we are well suited to provide a full menu of services.